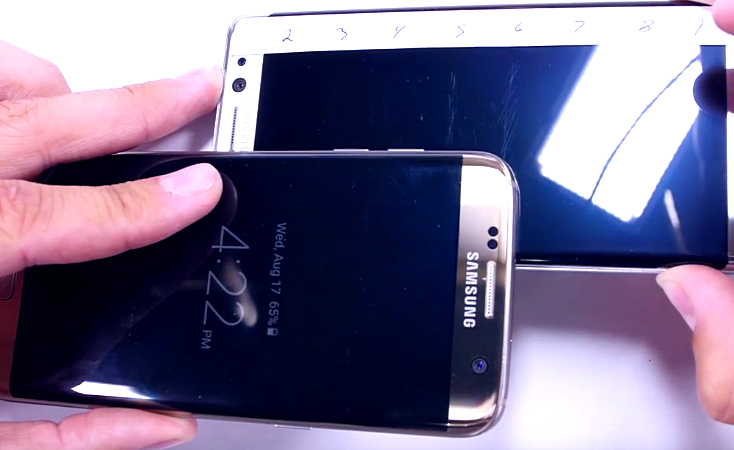 Samsung Galaxy S7 Edge, More Scratch-Resistant than Note7? If you're thinking about purchasing the new Samsung Galaxy Note7, you should seriously consider also getting tempered glass panels for it as the phablet's screen is not as scratch-resistant as we would have hoped it to be. Or at least that's the insight that I got from watching JerryRigEverything run his infamous durability test on this flagship-level release. Looking at the results, it's clear that the Note7's Gorilla Glass 5 panels start to show signs of scratching at Mohs level 3 whereas - interesting enough - TechPinas Badge of Excellence Awardee Samsung Galaxy S7 Edge with its Gorilla Glass 4 faces can take up to level 5 to 6. Additionally, they noted that "It can be very, very difficult to remove metallic material transfer from glass. It is very atypical to see in a field return when we look at scratches of glass, that kind of characteristic, but purely visual, perceived damage that is actually a material on top of the surface." Now, call me a critic but I don't think it takes a lab scientist to spot the difference between a scratch on glass and metallic residue.